I really enjoyed being able to “colour in” my existing sketch. I decided to keep it simple – a good reminder not to always keep adding to things. 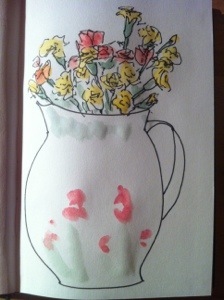 Today are you going to add more taller flowers to balance the size of the jug? Good idea burnout sure there’s room – may just redo!